Companies making devices that generate renewable energy from the ebb and flow of tides and waves around the UK could win a share of a new £20m government prize announced on Thursday. It is hoped the scheme, the Marine Energy Array Demonstrator (Mead), will encourage growth in the industry, which has been struggling to create a commercially viable projects. Ministers believe wave and tidal power could in the future generate up to 20% of Britain’s energy needs and create 10,000 jobs in the sector. The energy and climate change minister, Greg Barker, claimed Mead would help move the industry into the next stage of development. “This will take us one vital step closer to realising our ambitions of generating electricity from the waves and tides, powering homes and businesses across the whole of the UK with clean, green electricity,” he said. The prize money will be shared between two winners, who will develop the first wave and tidal devices to sit in array formation – much like clusters of wind turbines create a windfarm. 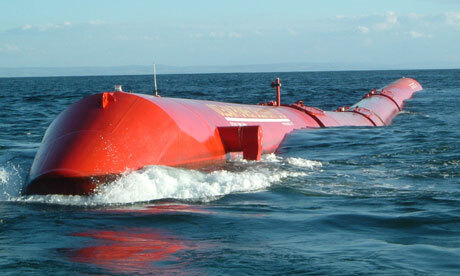 As an island situated in choppy waters, Britain is well placed to become a world leader in wave and tidal technology. Of the eight full scale prototype devices installed around the world, seven are in UK waters, and about half of the world’s leading marine technology companies are based here. But there is a growing fear that Britain will lose its early lead in the race to harness the power of the sea. In February MPs called on the government to increase their support of wind and wave technology, claiming the UK could be overtaken by competing countries if it did not continue to provide subsidies and support to the industry. Companies can enter the competition online via the Decc website. The closing date for applications is 1 June 2012. This entry was posted in Renewable Energy and tagged Marine Renewables, Tidal Technology, UK, Wave Power, Wave Power Technology. Bookmark the permalink.